Tony Blair, former British Prime Minister (L) and Denise Lewis (R) pose with the Social and Sustainable Development Award recipients 'The Ocean Race' The Power of Sport during the BT Sport Industry Awards 2019 at Battersea Evolution on April 25, 2019 in London, England. 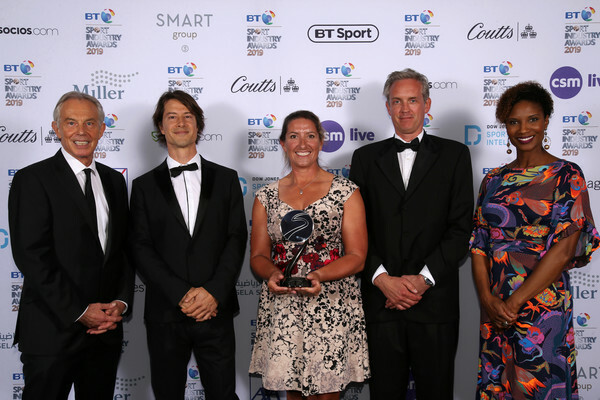 The BT Sport Industry Awards is the biggest commercial sports awards in the world and an annual showcase of the best of the sectorâ€™s creative and commercial output. The event brings together sports stars, celebrities, industry leaders, influencers and media from around the world for what is always a highly anticipated occasion.